Exciting Endeavors at the Awa Health Center! For a little background, the doctors at the Health Center are assigned to NUWAY by the government and are typically with us for a one year term. As you can imagine, a year goes by quickly and it seems as soon as the patients get used to a doctor, his term is up and we start over again. In the best interest of the patients and as of July, NUWAY has decided to invest in a permanent doctor that will be with us for a 5 year term or potentially longer. Although this costs more, it is definitely worth it for the level and continuity of care. Dr. Makuro was previously with NUWAY from August 2014 – July 2015. Because of his family and his love for the village, he made the decision to be with us for the next 5 years. We are very excited and privileged to have him back! With this exciting news, also comes a little bittersweet news. Our current government doctor, Dr. Somto, will be leaving us for his next assignment at the end of September. Sr. Somto has been a huge blessing to NUWAY. His professionalism, skill, and drive to improve the services and environment at the Health Center have been nothing short of impressive. Which leads to one of the most exciting projects going on with NUWAY: We are making major upgrades to the Health Center! 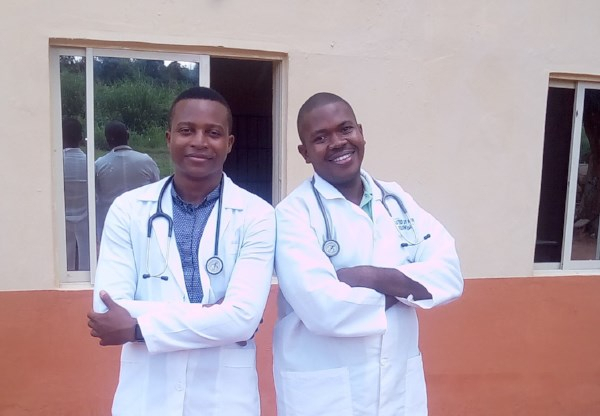 While Dr. Somto is orienting Dr. Makuro and helping him with the patient load from July to September, he is also leading the renovation of the Health Center! These renovations are the direct result of a proposal Dr. Somto made to NUWAY in late 2016 to improve the services and the facilities. We are thankful to the government for helping us with the exterior renovations that included a new roof, exterior painting, and new windows, not only to Health Center, but also to the doctor’s quarters. We hope you will join us at Bianu on October 14 where you can see all the exciting improvements for yourself!